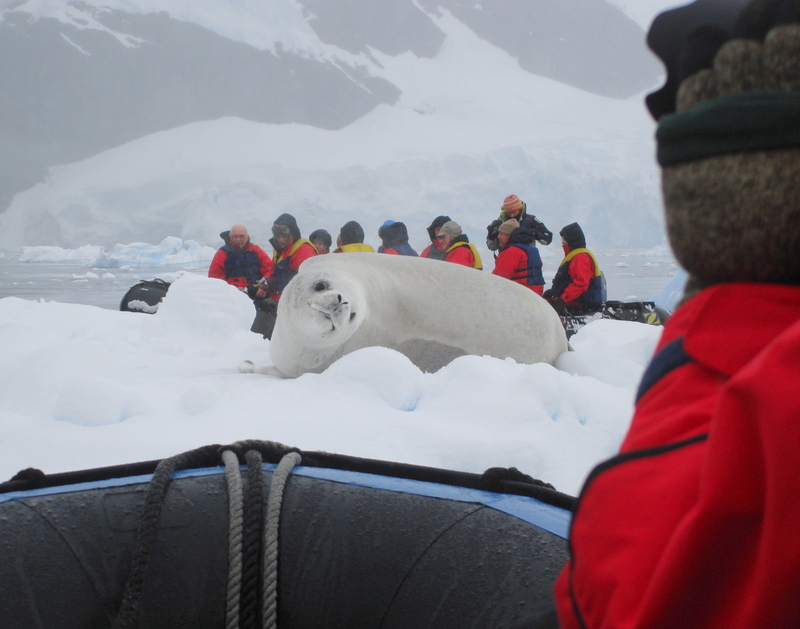 It started at 6:15 a.m. when all 89 of us boarded our zodiacs and rode around Pleneau Island, Antarctica. It was freezing but none of us were cold. Our Tauck World Discovery tour directors had given us all hand/feet warmers. As we rode around the island, we saw ice floating in perfectly clear blue water and the cutest sea lions lounging on icebergs and safe from their predator, the killer whale. 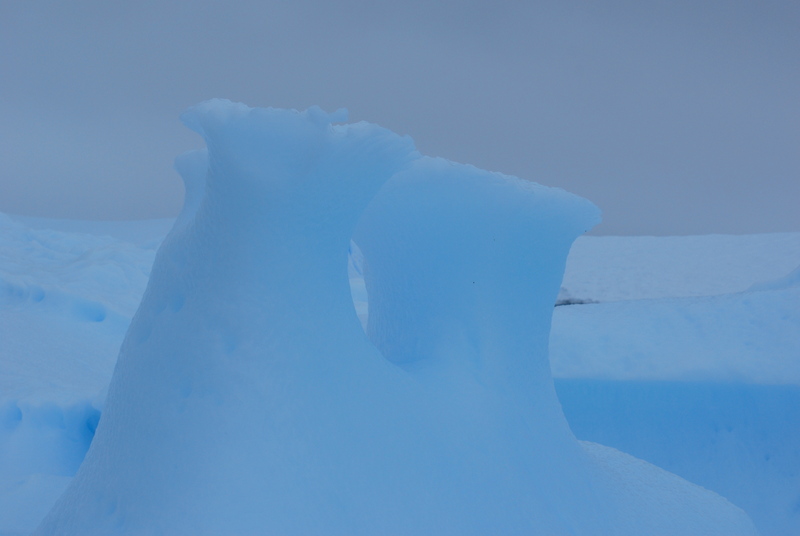 Next thing we knew, our Zodiacs had made it to the corner in the channel where icebergs jam up and can’t continue flowing with the current. In and out of Iceberg Graveyard we went, seeing 10 to 20, one after the other, like sculptures carved in marble. I thought I was in heaven. They were white, baby blue, dark blue and gray with ridges, and smooth surfaces, holes and points. And they were every shape, height and form you could imagine like Michelangelo had carved them. During this floating tour, I looked up and saw our ship, the Clipper Adventurer, and asked our guide the distance to the ship and the reply was “2.8 miles.” It looked like it was just a few hundred feet in that wide open pristine place. We had another first class experience for our afternoon excursion. Our Tauck World Discovery tour was the only one invited that year to tour one of the three USA Research Stations in Antarctica. 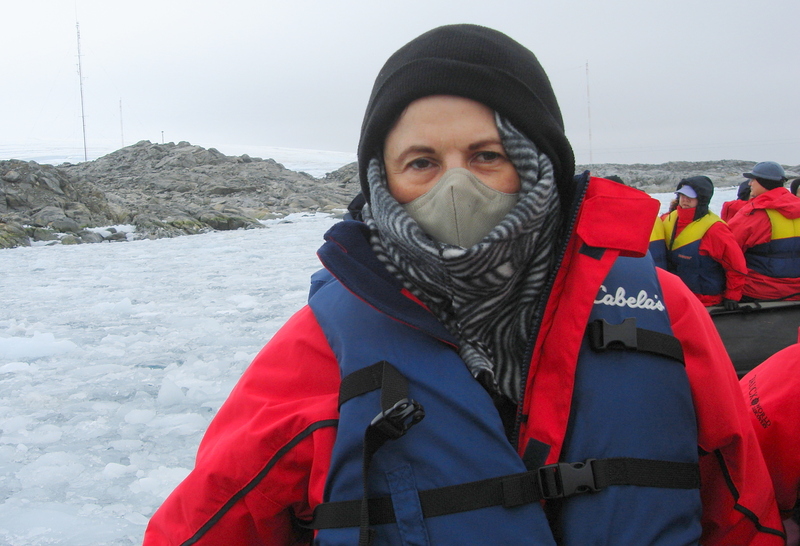 Only a few expeditions are allowed each year to visit the smallest station, Palmer Center at Arthur Harbor on the southwest coast of Anvers Island and the only USA Research Station located north of the Antarctic Circle. The station consisted of five buildings, plus helicopter pad and dock. Built in 1968, over 40 people work there in the summer, and 10 people work year-round. The station does biological studies of birds, seals and other components of the marine ecosystem. It has a large and extensively-equipped laboratory and sea water aquarium. Meteorology, upper atmosphere studies, physics, glaciology, geophysical, entomology, oceanography, and geology are being pursued at Palmer, as science is the purpose, not military. Over 150 studies are ongoing and all are done within two miles of the station. 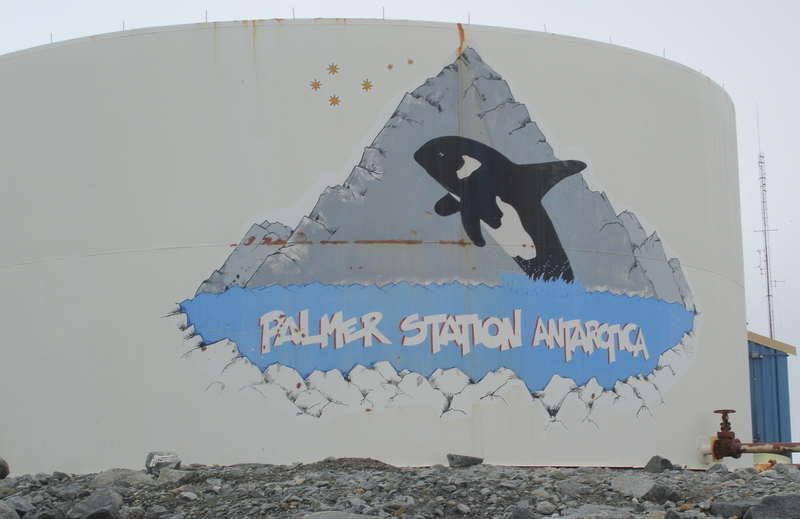 Our captain was doubtful that we would really get to visit USA Palmer Station because Sunday is a day of rest for the researchers, and getting to the station could be a challenge. But the researchers surprised us all and re-invited us all again. So we went in our Zodiacs to Arthur Harbor. Now, only one little problem remained getting there. 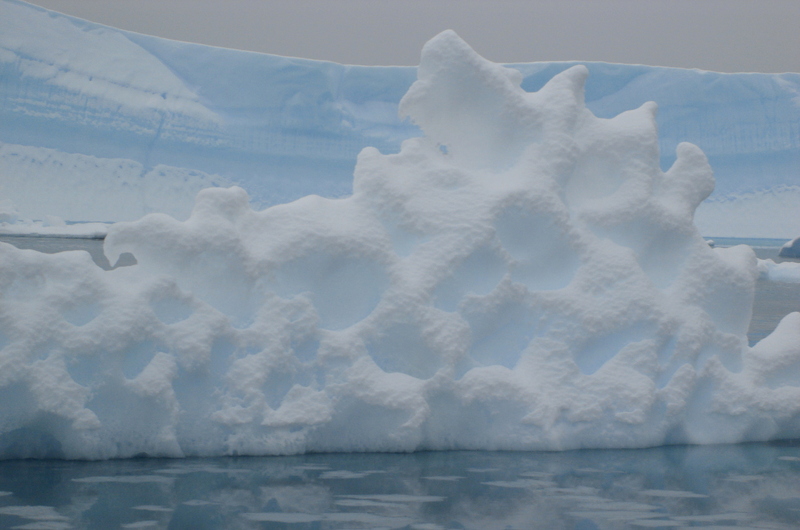 The Harbor was packed full of “ice chips” (up to three feet in each dimension) that had broken off the large icebergs. Like Iceberg Graveyard, the chips had jammed into the Harbor. And we were in our rubber Zodiacs with an outboard motor. We had a quarter mile to shore so it was a foot or two at a time. As soon as we would get going, the ice cubes would get between the Zodiac and the motor and jam the motor blades. So we would have to stop and the Zodiac operator would have to unclog the jam and go again, unclog, go, unclog, go, etc. I feared the six zodiacs would not make it. The Zodiacs were being torn up and the motor blades were bending. We persisted, however, and we made it! But the obstacles did not end. When we arrived at the Harbor, huge boulders, mud and mush awaited us. It took everything I had to get out of that Zodiac, trudge through the slippery muck and climb those huge boulders up to the Research Station. But persistence and determination paid off and I made it! The USA researchers greeted us and surprised us again on this priceless adventure. Guess where they took us first? We went straight to the Souvenir Shop! So now, I have all of the patches and shirts to prove I was there. Yes, a souvenir shop exists even at the bottom of the Earth! Next, they gave us a tour of the Research Station and summarized some of their research. And the final surprise from the researchers was homemade brownies and coffee for us in their private reception room. And was it good. 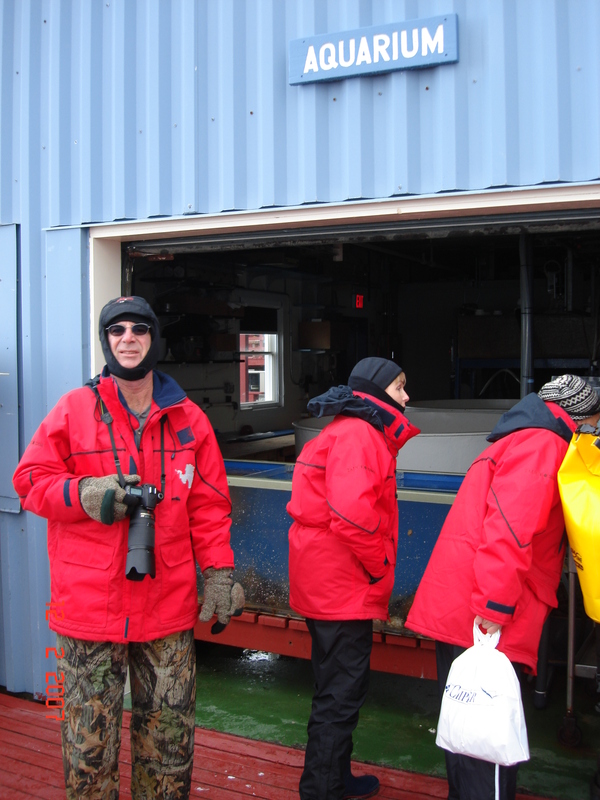 What a priceless once-in-a-lifetime experience we were surprised with visiting the USA Palmer Research Station, Antarctica. 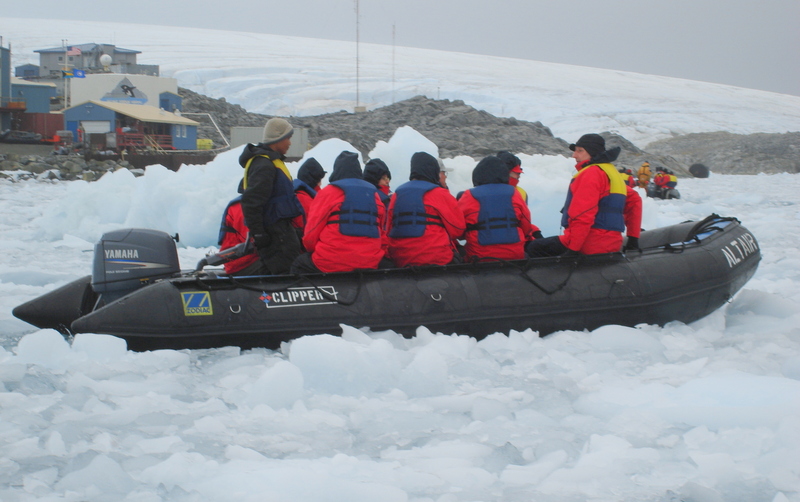 Our final return to the ship went well despite the “ice chips” as all the Zodiacs went together like a train. 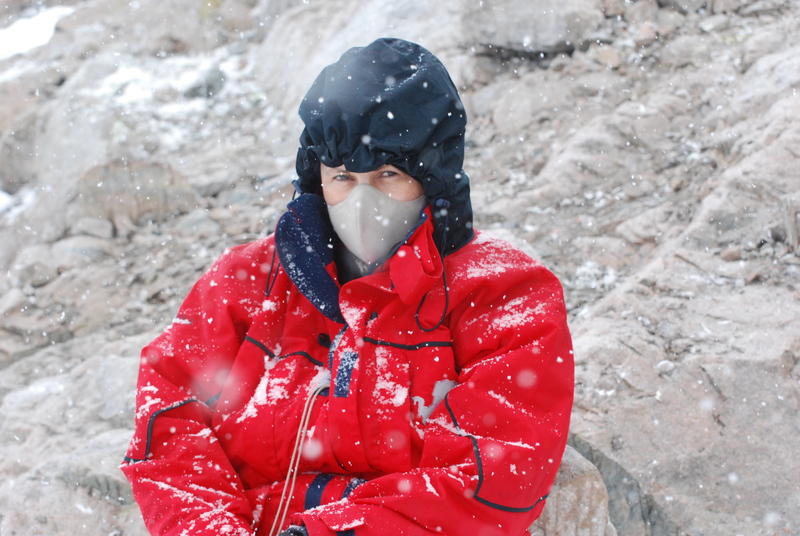 But one final challenge awaited us in Antarctica. 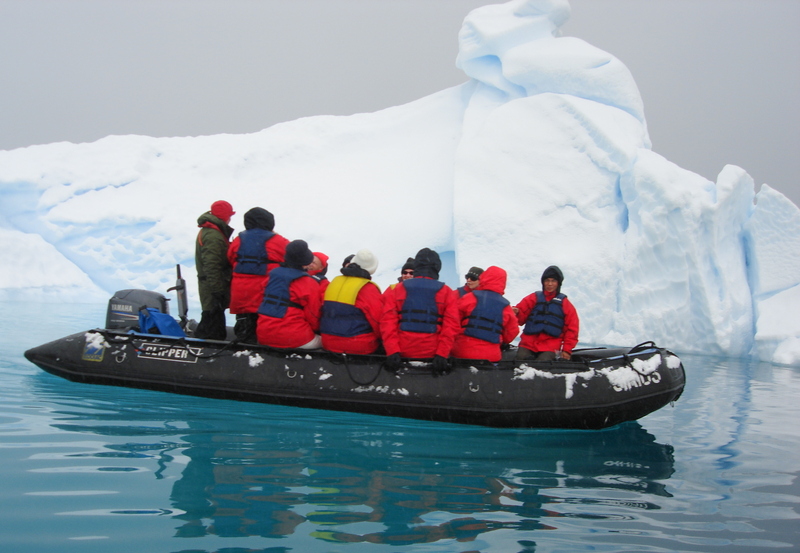 We couldn’t get on the Adventurer because a large iceberg blocked our Zodiac’s access to the ship’s staircase. 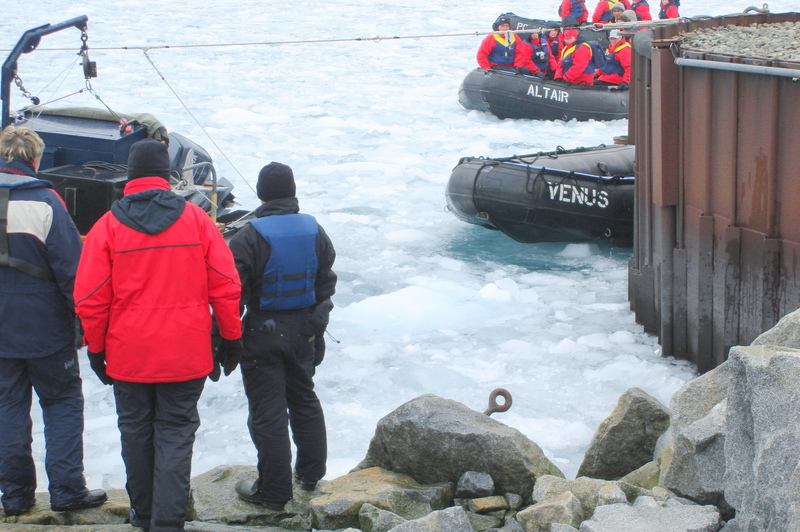 So our Zodiac just pushed that huge iceberg right out of the way and we made it safely onto the Adventurer staircase as snow fell softly on our red Antarctica parkas, a fitting end to a dream expedition.